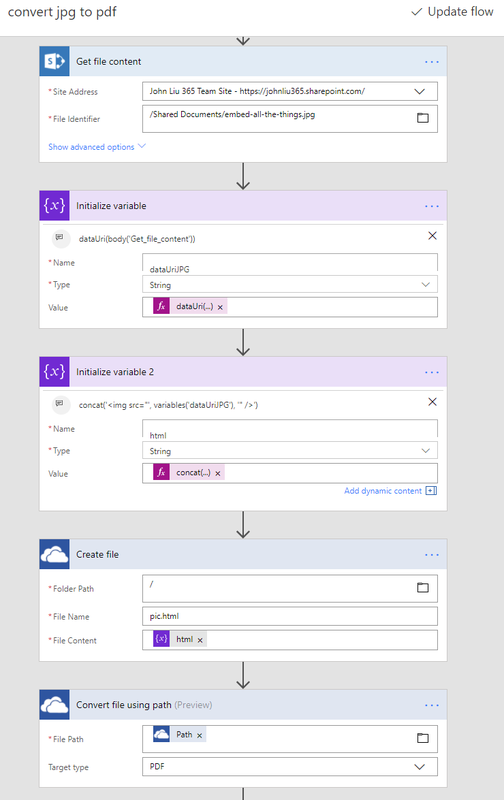 This is a crazy one, and if you have read ALL my Microsoft Flow blog posts, you'll be familiar with all these pieces. We are going to connect them a different way though, and the result is still awesome. Lets begin. Ultimate power: create Any HTML and convert to PDF. Effectively, we arrive at PDF-gen with templating. 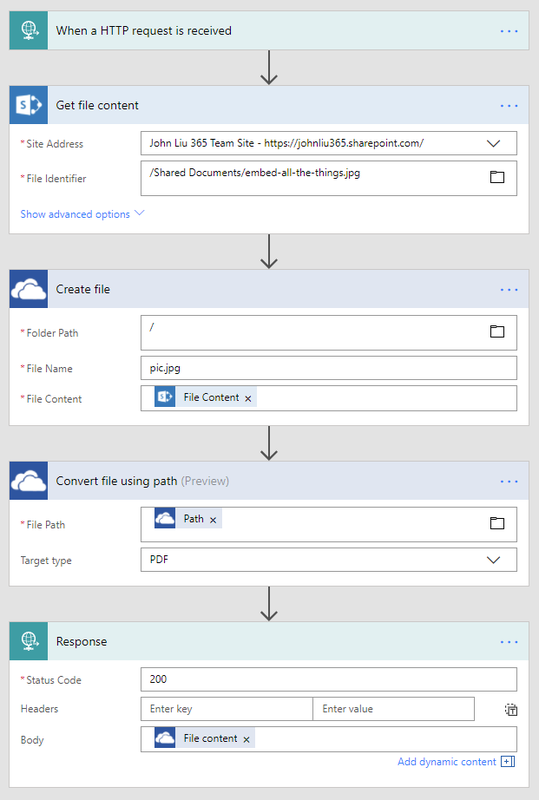 Get File Content (Binary) from SharePoint. Use Convert to PDF to convert JPG to PDF. This doesn't actually work. But it's good to try and see the error. Not Acceptable. This isn't the end though, we have workarounds. So even though Convert File doesn't work on image files directly, it does work on HTML. And this is the heart of our workaround. 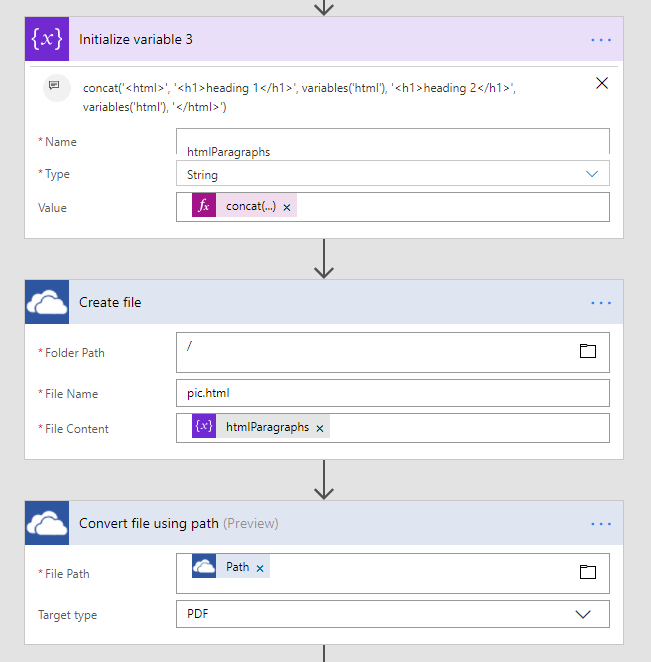 Remember several blog posts ago we used dataUriToBinary() to convert PowerApps camera image to a Binary file to store into SharePoint? We then create another string for <img src=variable(dataUriJPG) />. You'll need concat() expression to combine the string and variable. End with the ultimate power: create Any HTML and convert to PDF. And repeat that image twice. Read and include some live data. Create HTML Table - with automatic columns. We only have two fields. I leave the last example as a thought exercise for you, the reader. Store the HTML template in a HTML file. You really don't want to be typing HTML in concat within a tiny formula box. 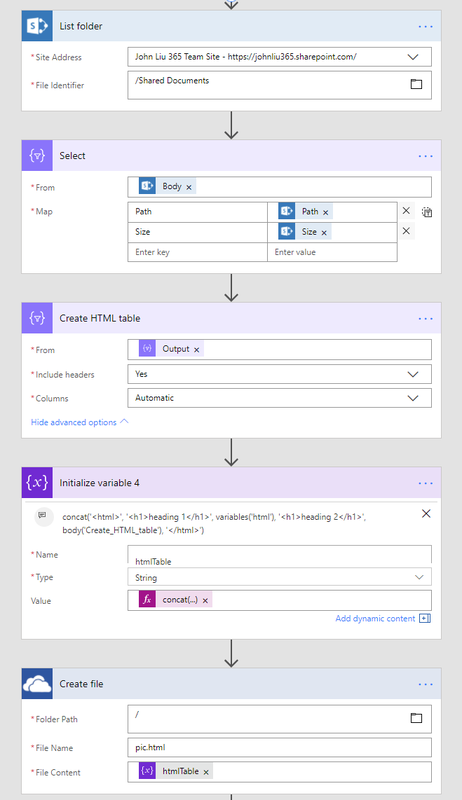 Use Replace expression to replace REPLACE_ME words with values you plan to fill from a live data source. Insert images as DataUri strings to easily get your logo, headers into the PDF report. 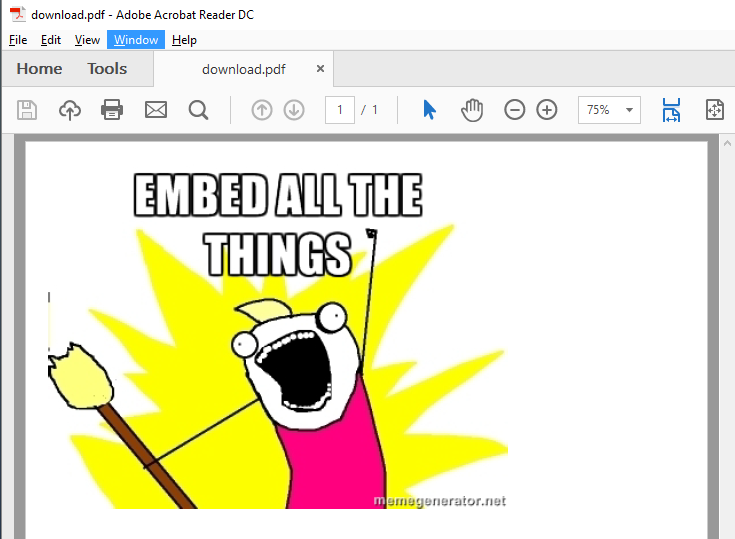 Consider using PDF to snapshot list item upon workflow completion, and then email that as PDF attachment to the manager. I have a favour to ask. See, I told @paulculmsee sneak peek about this post and he's like oh that's it?